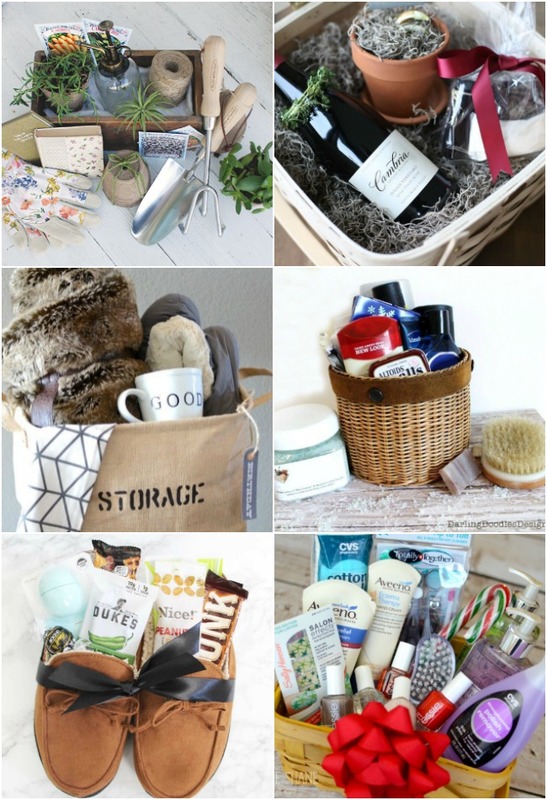 These twenty-two gift basket ideas range from a basket full of dad’s favorite things, to coffee and tea lovers baskets, to spa and kids baskets – and more. Easy to customize and make fit your budget, there is a gift basket here to inspire you for all your gift needs! 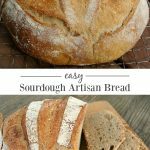 If you are looking for more doable DIY gift ideas, be sure to check out AOC’s Handmade Gifts page – you’ll find ideas everyone will love! 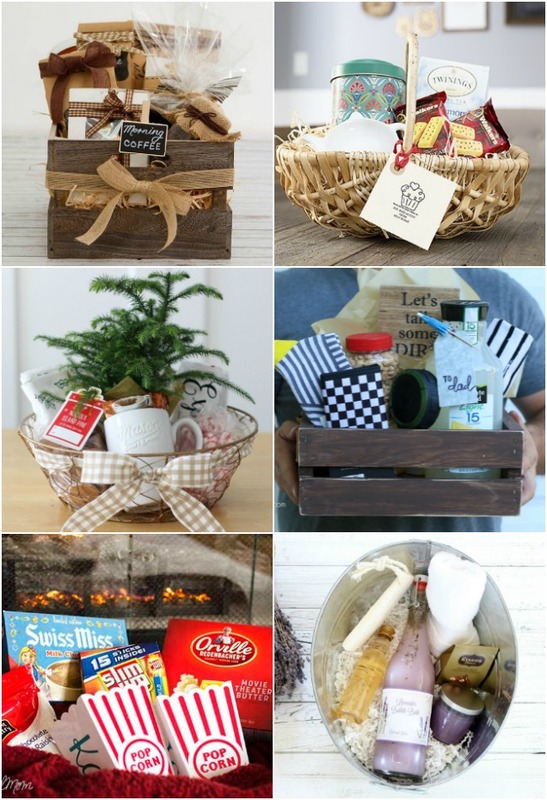 DIY gift baskets may be one of the most perfect gifts you can give to the people on your gift list. They can consist of all DIY items, some bought and some DIY, or all purchased, but because you put them together with thoughtfulness, it still counts as a “handmade” gift in my book. 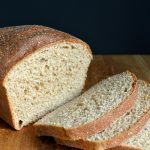 With the following gift basket ideas, you also have the option to add as few as two items to as many as you want, making gift baskets as inexpensive or as extravagant as you can afford. 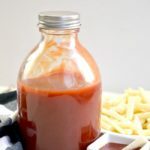 If you’re on a tight budget, making foods to add to some kind of container (many of these gifts in a jar would be great added to a basket with a towel or other food item, for example) are one of the best ways to give meaningful gifts that don’t cost a lot. And of course customizing them is what it’s all about. Have a niece who loves purple? That can be the theme! Find clothes, jewelry, nail polish, room decor, etc. that are all in shades of purple. 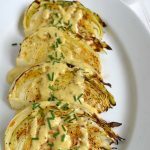 Know a man or woman who likes to cook? Spice rubs, favorite kitchen tools and more make sweet and useful gifts. 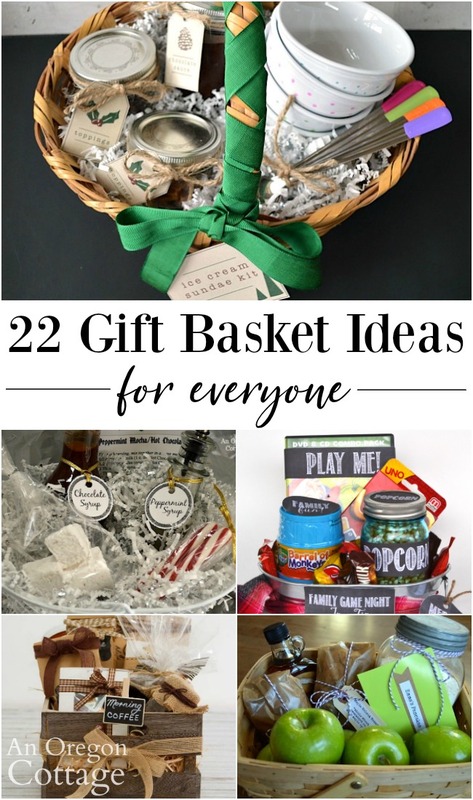 With this view, gift basket ideas can be endless, but I’ve gathered twenty two really great examples to inspire you and guide you in your own gift basket making. 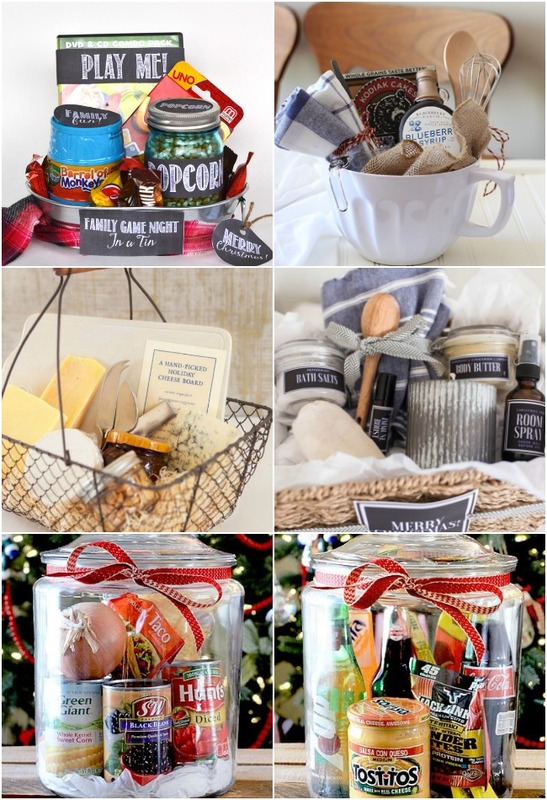 Oh, and “gift basket” doesn’t just mean baskets – you can put your items in any container! Below you will find some in large jars, old fashioned crates, bowls – and even a pair of slippers. Get creative with your container and it can become one of the best things about the gift. 1. 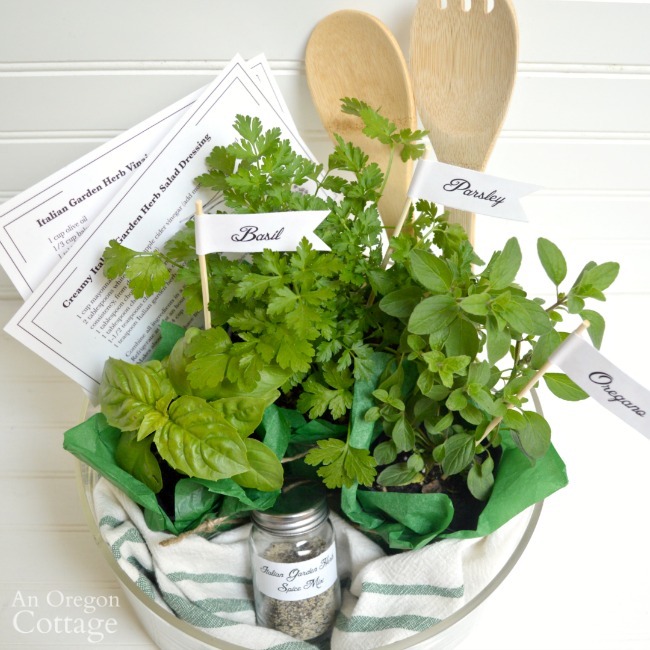 Italian Herb Garden Salad Dressing Gift Basket + Printables. 2. 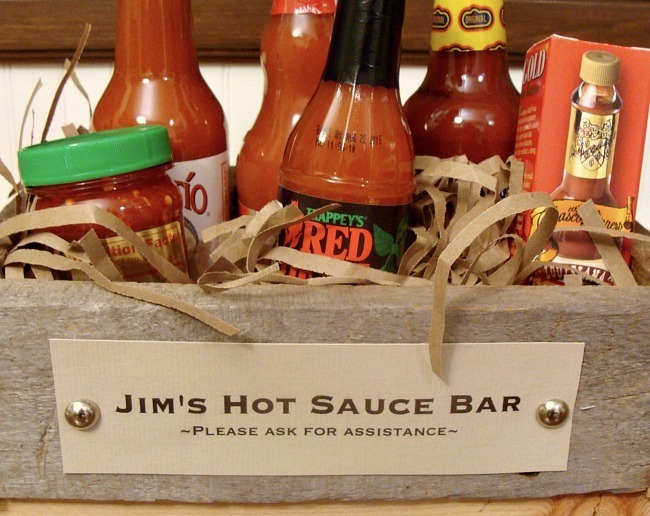 Rustic DIY Wooden Box Gift Idea Filled with Hot Sauces (or Whatever…). 3. DIY Ice Cream Sundae Kit Gift + Free Printable Tags. 4. Breakfast Gift Basket or Care Package. 5. 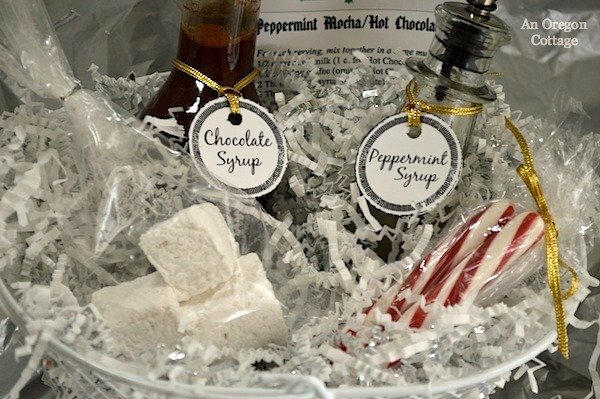 Homemade Peppermint Mocha Gift Baskets with Printable Tags. 6. Family Game Night In A Tin @ The DIY Mommy. I love giving family gifts at the holidays and this is such a great idea. Change out the games for the ones you know your recipients will enjoy. 7. 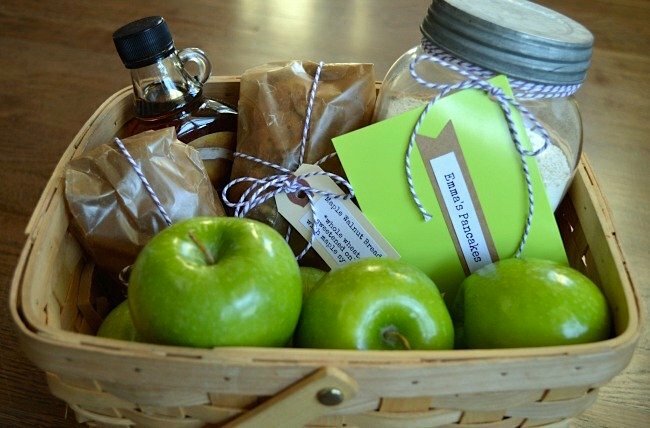 Pancake Breakfast Gift Basket @ The Bellewood Cottage. Adding the pancake items to a bowl you can make them makes such a wonderful gift for those who are just starting out. 8. Cheeseboard Gift Basket @ DIY Network. Find steps listed to make your own basket to build a cheeseboard, including a fun menu. 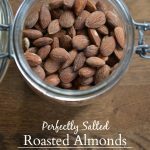 I’d also add some dried fruit. 9. Handmade Christmas Gift Basket With Free Printable Labels @ Farmhouse on Boone. Recipes for all natural room spray, body butter, immune boost roller, beeswax candle and more. You package them in containers and then attach the printable labels. 10. Guy Food & Taco Soup Gifts In A Jar @ One Good Thing By Jillee. 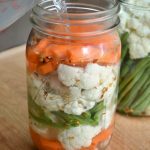 I love this idea of packing a very reusable large jar with foods guys love or the fixings for a taco soup (talk about useful!). You’ll also find seven more ideas for gifts in these large jars at the link. 11. Gardener’s gift basket @ The Merry Thought. 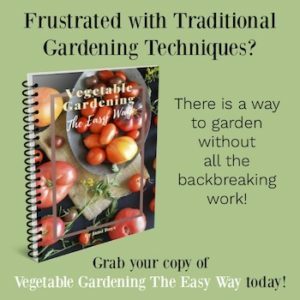 I love how this includes indoor plants and outdoor seeds to cover both indoor and outdoor gardens. 12. Wine & Chocolate Gift Basket with DIY Molten Lava Cake Mix Gift @ Julie Blanner. This idea is near and dear to me – one year I gave my lava cake mix as a gift with inexpensive ramekins. Adding the wine and a potted bulb is fun, too. 13. Take it Easy Relaxation Gift Basket Idea for Men or Women @ Fantabulosity. A storage bag full of things to keep me cozy and warm? Yes, please! 14. A SCENTsible Gift Basket For Him @ Darling Doodles Design. Men are hard to buy for much of the time, so putting a basket together with a theme of smelling good may just put a smile on your guy’s face – and give him practical things he’ll use. 15. Cozy Treat Filled Slippers for Him @ Pretty Providence. I absolutely love this idea – don’t just give a pair of slippers, fill them with a few treats he’ll enjoy, too. 16. DIY Manicure Gift Basket @ Jolynne Shane. How easy is this? And pretty perfect for the girls on your list. 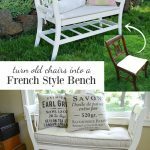 I probably would go smaller, but that’s the beauty of baskets – do what you can! 17. A Coffee Lovers Wooden Crate @ Koch. Coffee and sweets in a reusable farmhouse style crate. Love. 18. Tea Gift Basket for the Tea Lover @ Live Laugh Rowe. Of course there are tea lovers as well as coffee lovers out there. This is a great opportunity to make some fun tea cookies to add to the basket (these are shortbread based, and these go with everything and package nicely). 19. Holiday Hostess Gift Basket @ Glue Sticks. Doesn’t the presentation of this with the little pine for Christmas with other goodies make it so sweet? 20. DIY Dad Gift Basket – Stained Crate with Leather Handles @ Lolly Jane. 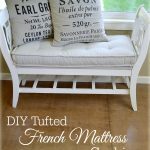 Stain a basic wood crate and add some leather handles before filling it with all the things your dad or guy loves. 21. “Let’s Stay In” Gift Basket with Personalized Popcorn Tubs @ Unoriginal Mom. This is basically my idea of a good night – popcorn and candy with a good movie. 22. Bath Spa Gift Basket with Repurposed Soda Bottle Bubble Bath @ Knick of Time. I think it’s so clever to make some bubble bath in a flip top bottle! I also like the tin container – again something that easy to reuse. 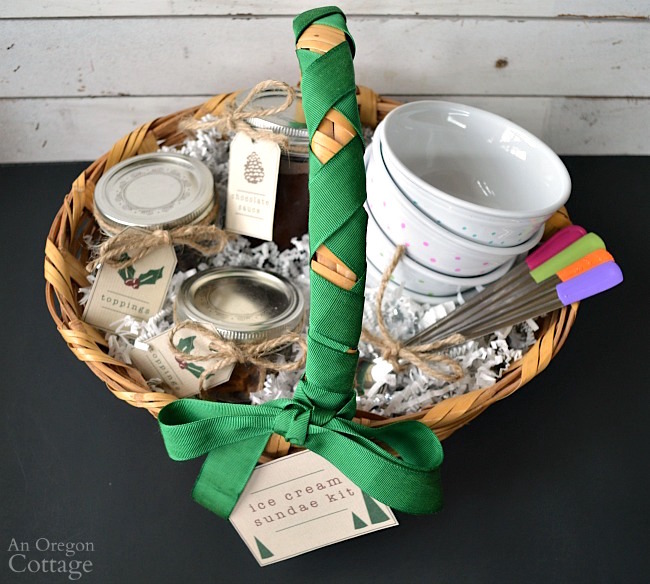 I don’t know about you, but I’m totally inspired and I’m already planning my next gift basket for our family Christmas gift drawing – one full of some my favorite kitchen items. What about you? Hope you found something to gift!